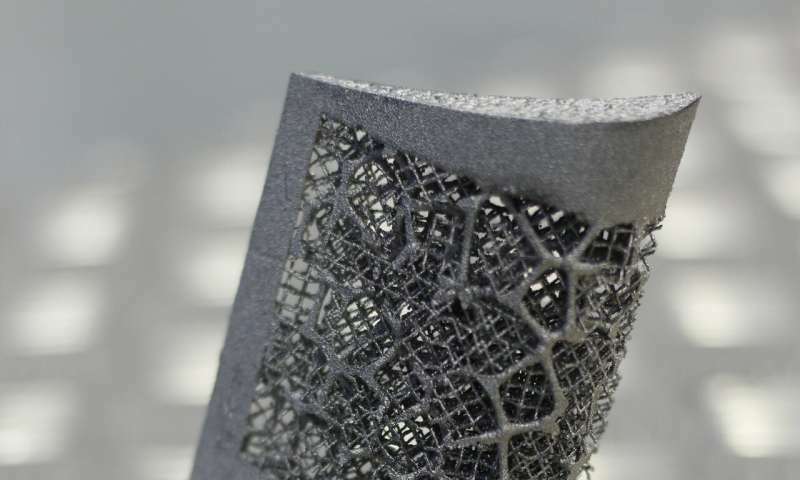 A team of researchers from Imperial College London and the University of Sheffield has developed a way to mimic the attributes of crystal lattices to make stronger 3D printed materials. 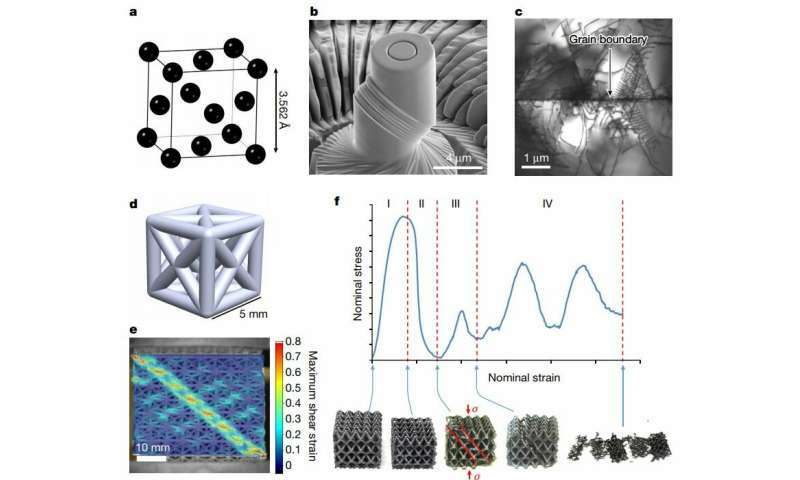 In their paper published in the journal Nature, the group describes how they transferred characteristics of microscopic structures to 3D printed polymer and stainless-steel lattices with nodes and struts analogous to the atoms and bonds of crystals. Gang Seob Jung and Markus Buehler with MIT offer a News and Views piece on the work done by the team in Great Britain in the same journal. The researchers note that microscopic crystal grains lie at the heart of metals, giving them strength and resistance to fracturing. They further note that the orientation of grain lattices in such crystals is important for providing such strength. Not always lining up, or butting up against a different structure helps prevent materials made of them from propagating small fractures, making them more robust. In this new effort, the researchers applied the same ideas to much larger 3D printed objects with the hope of giving them more strength as well. The researchers point out that 3D printing is used to create objects of many types, one of which is lattices. Such objects typically resemble the cross-hatched trusses found on railroad bridges. But because of the way they are made, layer by layer, such lattices are subject to complete failure if just a single cell fails. To make them stronger, the researchers programmed a 3D printer to create lattices with the same characteristics as strong crystal lattices, with box-like shapes serving as individual cells, or grains—in their tests, they used grain sizes from five to forty millimeters across. The researchers found that their approach led to increased strength in the lattice-like objects they printed. They also report that, as with crystals, the smaller the grain size, the stronger the resulting object. They also found that they could cause a printer to tailor-make grains and the way they were printed to mimic specific crystals, each offering different positive attributes in the final product. They suggest their technique could lead to the use of 3D printing in such critical applications as airplane engine fan blades. 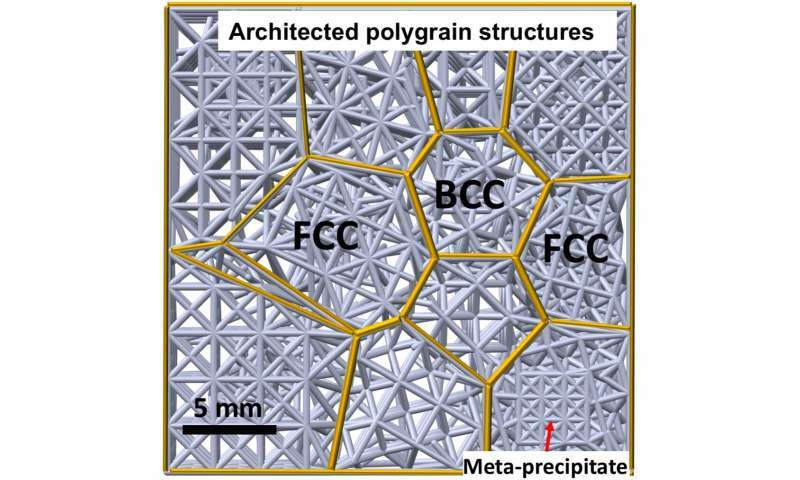 Schematic of polygrain structures, taken from Damage-tolerant architectured materials inspired by polycrystals, Credit: Minh-Son Pham, Chen Liu, Iain Todd, Jedsada Lertthanasarn, Nature, 17 January 2019.